File photo of Kathy Coy. A WOMAN IN THE US has pleaded guilty but mentally ill to attacking a pregnant woman and cutting her unborn child from her womb, leaving her to die. Prosecutors say that Jamie Stice, 21, was shocked with a stun gun before having her wrists and throat cut in April 2011. Kathy Coy of Morganstown, Kentucky faces life in prison without parole at her sentencing on 1 March. The infant born prematurely in the violent attack is learning to walk and beginning to talk. Before today’s hearing, his grandmother Jeannie Stice proudly showed off a photo of the child atop his father’s shoulders. Ten-month-old Isaiah Allen Stice Reynolds lives with his father and is said to be thriving, despite being born about five weeks early. Coy, who had shown little emotion in previous hearings, cried and shook her head today as a prosecutor read the evidence against her. 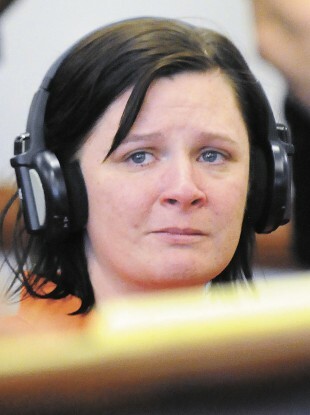 Her slight, high-pitched voice shook with emotion as she entered her plea to murder, capital kidnapping and kidnapping. She wore an orange jail jumpsuit and leg irons. “The brutality of it is like nothing any of us have ever seen,” Warren County Commonwealth’s Attorney Chris Cohron said afterward. Police had said Coy and Stice were Facebook friends. Stice’s mutilated body was found off a dirt road in southern Kentucky on April 14, a day after she had been seen leaving her home with Coy. Police arrested Coy at a local hospital after she arrived with the infant but showed no signs of having given birth. Police searched Coy’s home and computer, finding links to two pregnant women on her Facebook page. Investigators found one of the women unharmed, but couldn’t find Stice. Police would later find a stun gun and two knives believed to be used in the attack. Coy eventually led detectives to a wooded area off a dirt road, where Stice’s remains were located. Winn told reporters today that Coy had faked pregnancies and was obsessed with the thought of having a baby. Coy has two children of her own but they didn’t live with her, Winn said. ”The miracle in the whole thing is that the baby made it,” Winn said of Jamie Stice’s baby. Stice’s brother, Eric, said his nephew will grow up knowing about his mother and her hopes for him. She wrote letters to her son during her pregnancy that he’ll be given. Relatives visit her grave regularly, sometimes taking Isaiah along. “I’d say it will probably be a tradition to fill him in how much his mom loved him and how much she wanted to be there,” he said. Email “Woman facing life in prison for cutting infant from womb”. Feedback on “Woman facing life in prison for cutting infant from womb”.